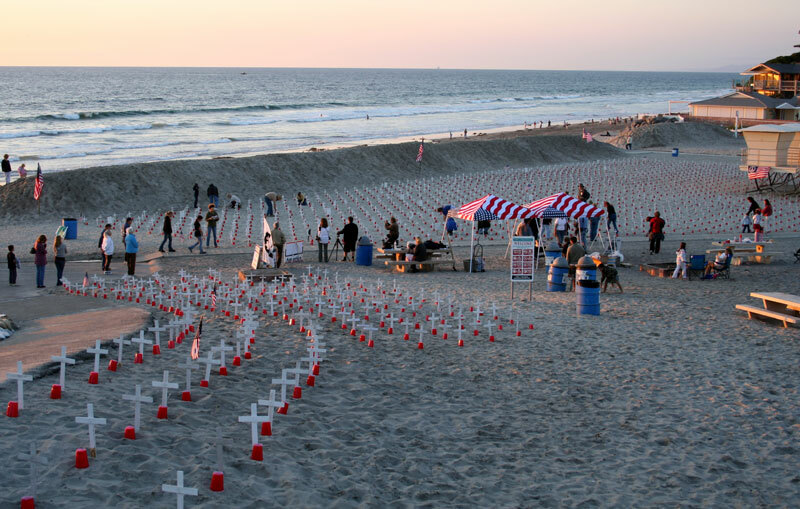 Santa Barbara Chapter of Veterans for Peace, working with artist and activist Steven Sherill, first began setting up Arlington West on the beach near Stearns Wharf, in November of 2003, as the first American casualties began arriving home from Iraq. A few months later, Jim Brown from San Diego Veterans for Peace set up the second Arlington West on the beach at Oceanside, followed by a similar memorial in Santa Monica by the LA Chapter, in February of 2004. The San Diego memorial was set up about once a month for the first couple of years of its life, then, as the whole project grew larger, about 6-8 times a year, sometimes being extended to other locations around the county. Although not a weekly event like those in Santa Barbara and LA, it remained unique among VFP chapter displays in its outreach primarily to active duty Marines from Camp Pendleton and their families. During 2004, Jim Brown and Jim Summers from SDVFP drove to Santa Barbara for an all day conference on Arlington West, attended by members from Santa Barbara, Ventura, Los Angeles, and Orange County chapters of VFP and other interested parties. The understandings and connections built there served to help all chapters achieve a common focus: that this was a memorial more than a protest, that we had to reach across the usual party/cultural divides, and that we needed to focus on the cost of war with this very graphic display. It also created a loose network for the exchange of ideas, practical techniques for handling the display, and built ties between VFP chapters. The media loved Arlington West, and the San Diego version appeared frequently in articles and photographs in area newspapers. It was discussed many times on the radio, and was regularly featured in television news stories. Newspaper photographers and television newscasters especially seemed to love the visual effect of row after row of white crosses, illuminated by the soft glow of candles, with the sunset in the background. Visitors, VFP members, and VFP officers were interviewed, with this as a backdrop, a number of times for prime time news, both on English and Spanish language channels. More recently, the memorial has been set up for Veterans Day, Independence Day, Memorial Day and other special occasions, and by special invitation from other groups. SDVFP has decided that now, in February of 2012, after eight years of Arlington West, the time has come to acknowledge our chapter’s shift in focus, and honorably retire the memorial as we move on to other aspects of our work. Arlington West has changed us forever, as individuals and as a group. We feel honored to have been a part of it, and honored to have shared the work with so many. Click to read about the Arlington West Memorial.